When I started blogging, everything I read said that in order to be successful, you needed a mailing list. So the first plugin I installed on Financial Slacker was JetPack. It has loads of useful features like spam block, social media widgets, a comment form, and of course a blog mailing list signup form. But after using JetPack’s mailing list service for a while, and after doing more reading, I decided that I needed more control over my mailing list. This is when I discovered MailChimp. I will start off by saying I am a fan of MailChimp. It’s easy to use and has served me well. But more recently, I’ve been struggling with getting my mailing list management system to do what I want. And if you’re a Financial Slacker email subscriber you may have noticed. When I first started looking at third-party mailing list management systems, my research led me to two alternatives – MailChimp and Aweber. There’s plenty written about each one and the deciding factor for me was that MailChimp is free to use for your first 2000 subscribers. It seemed like a no-brainer. When you’re just starting out blogging, it’s hard to justify spending money. I may be falling into the cheap vs frugal trap, but I really do hate spending money especially when you can get a comparable product for free. So I set up a free MailChimp account and started building my mailing list. I also added the MailMunch plugin because I wasn’t pleased with how the free MailChimp optin forms looked. I think the free MailMuch forms look a little nicer. The system worked great and people started signing up using the forms. Fast forward to the present. If you’re a Financial Slacker email subscriber, you may have noticed some odd things happening with the recent articles. When I write an article, I typically post it right away. I’ve always been envious of those bloggers who write and save a bunch of articles for future posting. But that just hasn’t been me. I am impatient. As soon as I finish writing, I want the article posted. I know this impacts my consistency and may not be the best way to write, but it’s how I’ve operated since the beginning. And not only do I want the article posted on Financial Slacker immediately, I also want it emailed out to my subscribers immediately. MailChimp has a nice feature that allows you to set up an automatic email of all your posts. It pulls the RSS feed and puts the article into an email and sends it out. But it only sends on the hour and only when you have scheduled it to send. If you post after that scheduled time, the article won’t get sent out until the next day. To work around that limitation, after I publish an article, I go to the MailChimp site and change the RSS campaign delivery time to coincide with the next nearest hour. If I post at 9:30 am, I set MailChimp to deliver at 10:00 am. This creates a small gap between when I post to the site and when it gets emailed out. To compensate, sometimes I’ll set the article to publish at 5 minutes before the hour so the gap is small, but there’s still a gap. It’s especially frustrating when I finish an article at 5 minutes after the hour. Then I need to wait an entire 55 minutes before the article gets sent out. I told you I was impatient. And because I don’t always post articles at the same time every day, I wind up having to go into MailChimp and change the delivery time almost every time I post an article. Honestly, this isn’t a huge deal, but it just seems inefficient and lacks elegance. So I started searching for a solution and found AutoChimp. This is a nifty little plugin that automatically sends out a MailChimp campaign immediately when an article is published. The problem is that AutoChimp is no longer being maintained. So there are some holes. One big hole is that I haven’t been able to change the email template. This means the last few articles that were sent out didn’t have any links back to Financial Slacker. So if someone read the email and wanted to comment or wanted to visit the site and read other articles, they had to go into their browser and manually enter the site address. Again, this is very inefficient and not how I want readers to experience the site. So I deactivated AutoChimp and went back to manually changing the distribution time in my MailChimp RSS campaign. Of course, because of the way the RSS campaign works, when I switched back, the next email didn’t just have the current article, but also the prior articles that had been sent out via AutoChimp were attached as well. The other day I discovered a paid plug-in that appears to support the AutoChimp functionality, but I hate the idea of having a bunch of separate paid plugins, so I held off purchasing. In addition to the email campaign issues, I’ve found another problem with my current mailing list management solution. On almost every blog I visit, when you leave a comment, you can check a box to also signup for new posts to be emailed. If you require someone to enter their name and email address to make a comment, it seems reasonable that at the same time, you should ask if they would like to sign up to receive new articles when they’re posted. 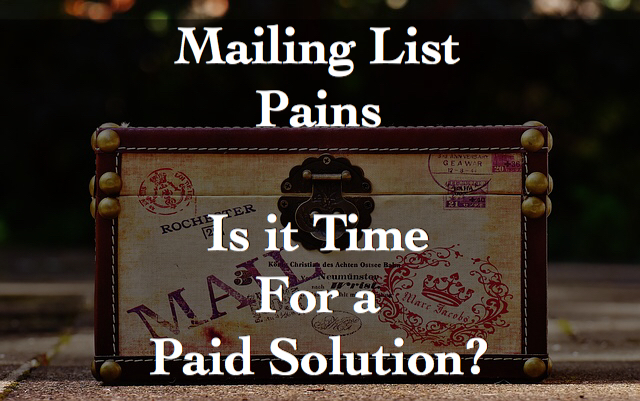 It requires no additional effort from the reader and helps you build your email list. That functionality works great with JetPack, but if you want to use MailChimp, you again need another plugin. And of course, the plugin that I’ve been using has some quirks. For one, it doesn’t always show the signup check box. And I have had trouble formatting the signup check box to be consistent with the comments signup check box which is still JetPack. I’ve also added a pop up signup box to the site. They convert really well, but like everyone, I find pop up boxes annoying. Especially for subscribers, I want to minimize the annoyance factor. So I’ve moved the box down to the bottom corner of the page, but it is still annoying to have the box pop up if you’re already a subscriber. Again, I can pay to have the pop up box hidden for subscribers, but that’s another one-off plugin fee. Another issue that I’ve encountered is controlling the frequency of emails. You may have noticed that recently I have increased my posting frequency from an average of 2 to 4 articles per week to daily posting. I’m not sure if this is going to be a permanent situation as I’ve considered taking off the weekend to avoid burning out, but for the moment, I’ve enjoyed writing more frequently. But as much as I enjoy writing daily, I’m not sure my readers necessarily want to be getting an email from me every day. We all get way too much email as it is. And while some subscribers like to read an article every day, others may prefer to have the articles batched together so they can pick and choose or read three or four at one sitting. I actually haven’t spent much time looking at this issue as it really wasn’t an issue until I started posting more frequently. But I do want to make sure that whatever email solution I use allows the reader to dictate when and how often they receive posts. As Financial Slacker continues to grow and expand its readership, I am looking for ways to improve the overall experience. And while the free solutions may have worked when the site was just getting started, as things have grown, it may just be time to start exploring more complete options. My goal with this site is to provide valuable information in an easy to absorb manner. That means however the reader wants the articles delivered, I want to make it as flexible as possible. So whether you like to just read one article at a time, or you prefer to read multiple articles at one sitting, or whether you want to easily leave a comment, or signup for an email subscription, I want the process to be clean and seamless with the least amount of work required on your end. For all of these issues and others, I’ve found various paid plugins that might do the trick, but it seems ridiculous to pay for multiple plugins from multiple developers to handle what the mailing list manager should do out of the box. So I am back to evaluating my options for a mailing list management system. I’ll let you know what I decide, but in the meantime, I did want to apologize to my email subscribers for the inconsistencies they may have noticed recently. Readers, do you have any suggestions for a mailing list management system? I would love to hear what has worked for you and what hasn’t. My mailing list is still relatively small, so I’m using free solutions too. I recently switched to MailerLite and have been happy so far. They’re small and hungry and it seems like they’re adding new features every week. I like that I can send an RSS auto email which is an excerpt of my post and includes the featured image. That said, the emails do go out once per day. My recommendation is to set a frequency – daily, MWF, whatever – and a time – 5am, 12noon, etc. – and then set your RSS campaign appropriately. This way you can schedule your posts, and your readers know when to expect to hear from you. Reduce your workload, and build a sense of expectation in your readers. Plus, if you’re not posting daily, it lets you build up that queue of posts so you don’t get burned out, and can take some time off and know your readers will still have something interesting to read. Automation, and scheduling, are your friends, if you let them. I do like the idea of getting more proactive and having a queue of posts ready to go. It might make sense to keep writing every day but only post every other day. That would solve many of the problems I discussed. Thanks, ONL. I love hearing the contrarian opinion. It’s in my nature to tinker. Whether it’s something in the garage or this site, I do find that I’m drawn to change things and see what happens. I’m not sure that’s always the best use of time, but it’s a hard habit to break. I don’t have an opportunity to post as often as you right now, so I’m still doing things the way you are working to get off of. I use MailChimp for my signups and use their RSS feed emails. However, I do my emails as a weekly newsletter, so the timing isn’t as big of a problem for me. I do love the WordPress plugins! Although recently, I’ve been exercising my closet IT side and programming some of the functionality on my own. My skills are rather limited, but it’s still fun to see what I can do. Very interesting FS – I remember talking to you about this a while back. It’s hard to get the exact solution that we want. I’ll be very interested to see what you end up with. You could set the email time to be 4am and then it’s always going to be sent out at an (in my mind) okay time. Good thought, Tristan. I’ve always wanted to make sure that emails go out at about the same time as an article is posted to the site. But I’m not sure that really matters. People don’t drop what they’re doing just because they get a new article emailed to them. They’ll visit the site when it’s convenient.